Heather at Jeweled Elegance had a giveaway to celebrate her cute patio being finished. 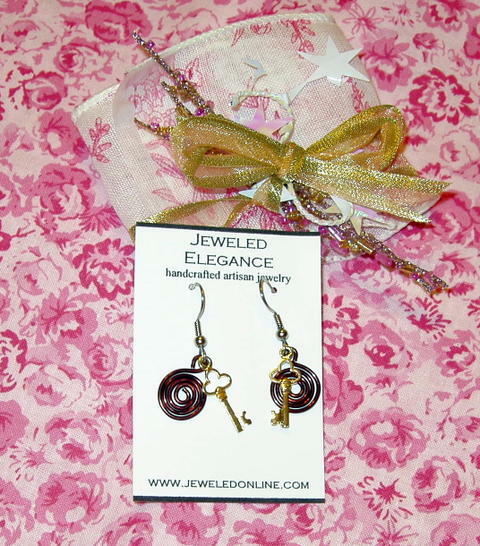 I won these, oh so cute, key earrings. She makes lots of different designs, so you'll have to go check out her shop. 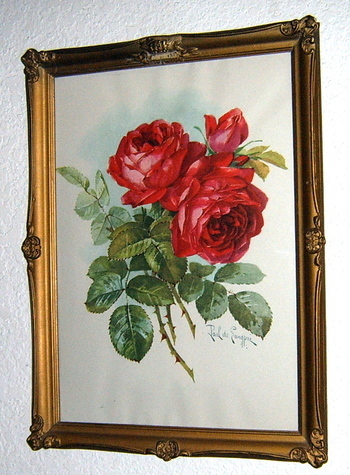 I thought that I didn't have much to show you from my estate sale, thrift store hunting trips lately. Then, I piled it on the bed and realized that I had found quite a bit of treasure lately. 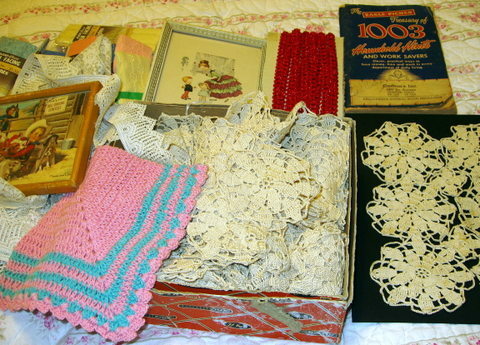 I love the box of crocheted medallions. I assume that this was to be a tablecloth but was never finished. 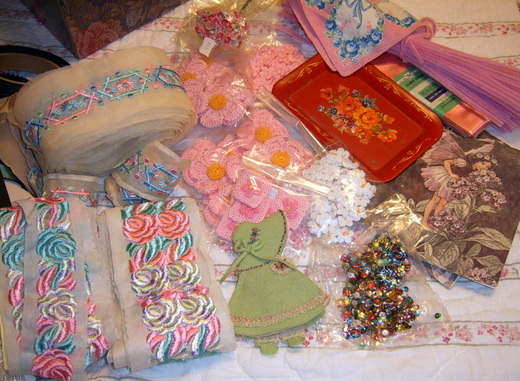 I'm going to use them for ornaments and purse embellishments for my Christmas boutique items. 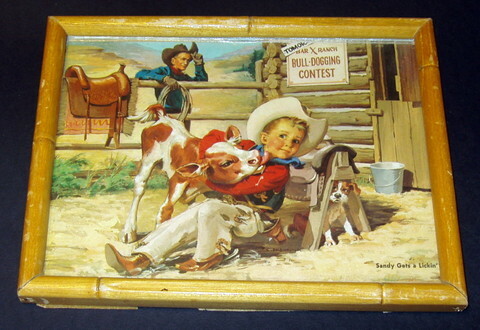 See this little cowboy picture? I love old 50's cowboy prints. One day I want to have a house with a family room that I can decorate Roy Roger's and Dale Evan's style. I forgot to add in my post yesterday that those are copyright free Victorian images. Feel free to take them and use them in your own artwork. First this Paul de Longpre print under convex glass for $5.00, found while out hunting through thrift stores. Then today at two estate sales, this assorted treasure trove. 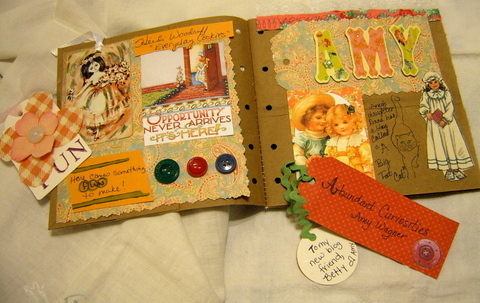 I love the little sunbonnet girl needle book. The ribbon is gorgeous and the lady apologized to me for having to sell it for $2.00 each. What?! I guess she doesn't sew or hasn't been in a fabric store in a long time. A little package of millenery flowers, packages of crochet flowers. Time for me to get to work creating! I managed to get some weeds pulled and cleaned my front porch on Friday night. Friday night was also date night and we saw Rush Hour 3, which was the most "fun" I've had at a movie in awhile. We laughed and laughed. Saturday, we went to a mile long yard sale. I was hoping to find a bench for my front porch. I didn't find the bench but I managed to come home with a few treasures. 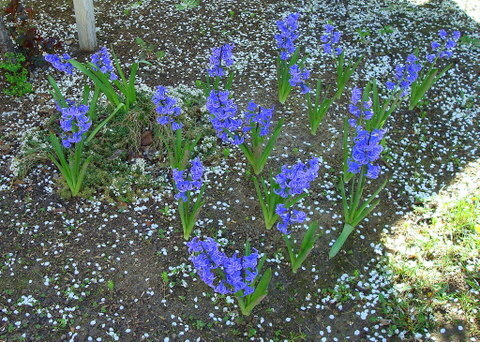 The flowers you see are on a vintage pair of pillowcases. Analise at Sugar*Sugar lives in my town though we've never met in real life. She loves shopping at thrift stores too. She was sweet enough to not only, not buy, all of the seam binding at a thrift store in town but email me and tell me where to find it. I ended up buying two bags from that thrift store and another bag from the thrift store in the same shopping center. 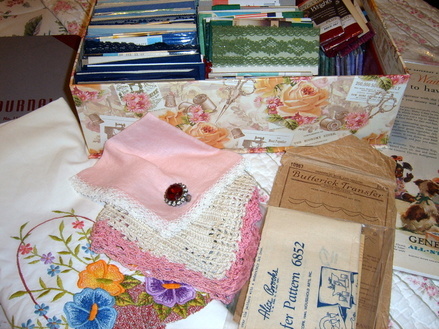 I bought that pretty box at Tuesday Morning and now it is full of seam binding and hem tape. Thanks Analise! I think I owe you a cup of coffee. 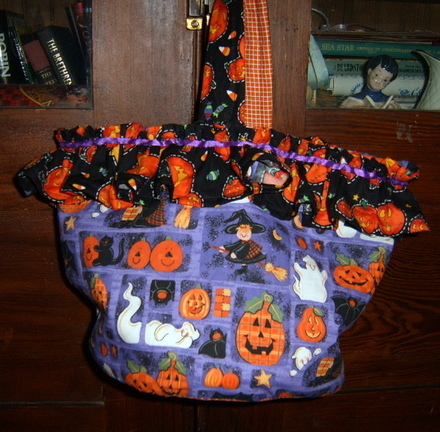 Sunday, I made this Halloween bucket. I didn't have a pattern, just an idea in my head. Next time I will have to use a heavier interfacing so it will stand up by itself. Of course, if I filled it with chocolate it would keep its shape. The only thing is, my shape would suffer because the chocolate would end up in me! Yesterday, my best friend came bearing presents. 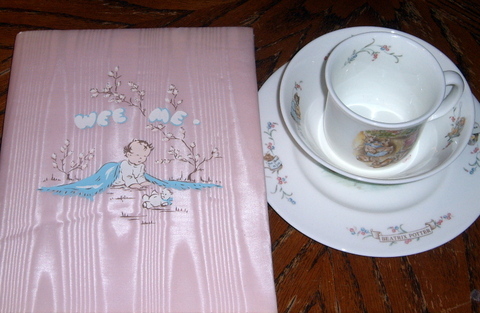 She picked me up to go to the antique show and brought me this adorable baby book and a Royal Doulton Beatrix Potter child's place setting. My best friend is the bargain shopping queen. She found the book for less than a dollar. It is unused and has adorable graphics. I think it is probably from the 50's. 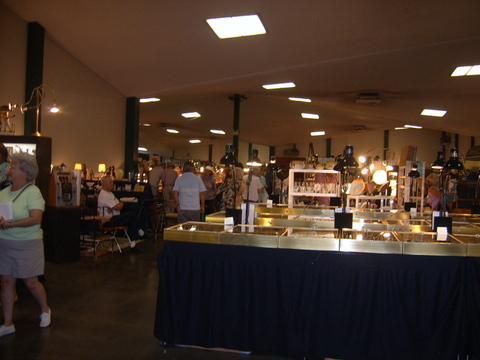 The antique show is on the fairgrounds in the commerce building and it was jam-packed with antiques. There were 89 booths and the dealers came from as far away as Idaho. I was eavesdropping (shame on me) and heard one lady telling her friend how overwhelming the show was. It is that big! 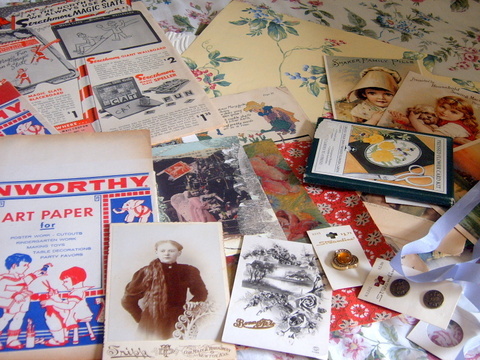 The antiques varied from ancient to newer pop generation collectibles. I wish that I had taken a picture of my favorite booth. 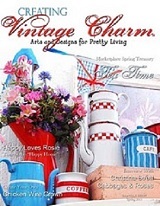 Times Past from Parma, Idaho has the cutest jackets and purses made from vintage barkcloth. My husband and best friend have told me that the jackets are for "older" women. So, my plan is that when I turn 50, I am buying one or two! I really should go back and buy one now, in case she isn't there when I turn 50. 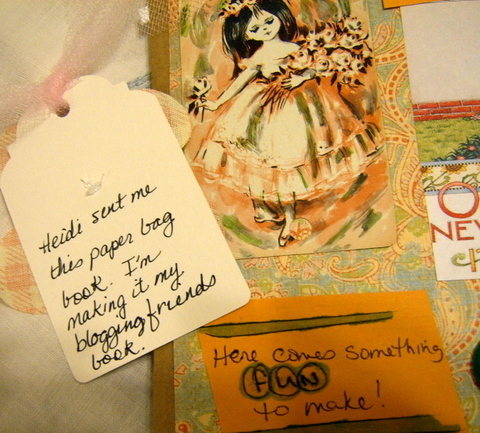 Or, I could remember that my blog is about sewing and make myself one. I just have to find enough barkcloth. I did find a few things to take home. 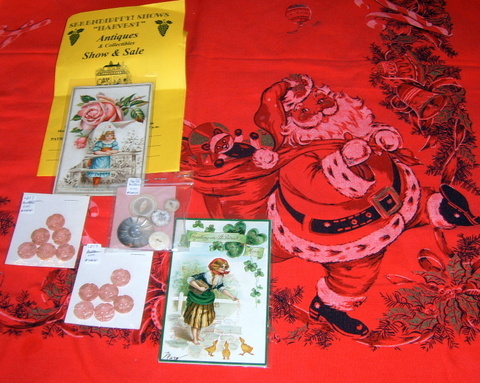 I bought some buttons and two vintage postcards. 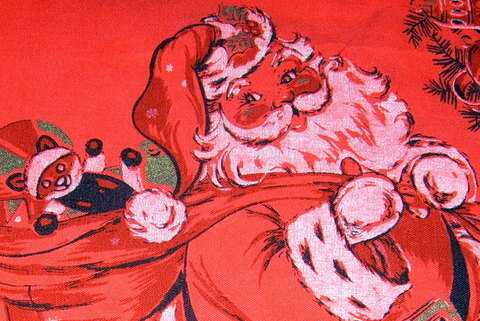 I also bought this extremely vivid Christmas tablecloth. Yes, it is that bright, but, Santa's face is so cute! 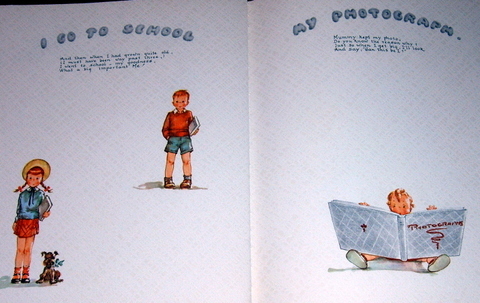 I came home and worked on some pages in my blog friends book. I finished Karla and Beth's page. 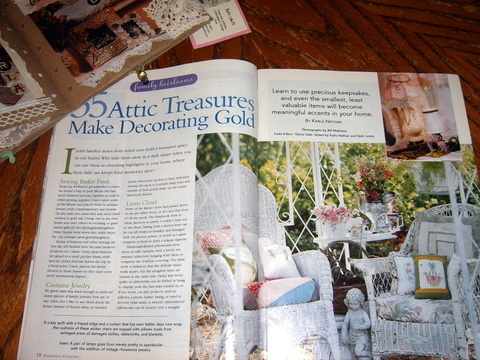 I wanted their pages to be side by side because of this article I found in an old Romantic Country magazine. It was written by Karla Nathan and styled by Karla and Beth Leintz. I bought the magazine at a yard sale and was thumbing through it and saw Karla's name. I was absolutely stunned because it was the same day that a charm came in the mail from Karla. Karla and Beth are friends and they often talk about each other on their blogs. Both of them are so talented! A little magic came in the mail from Jenny at Old Bag New Tricks. The pretty wand you see on her page in my book was a gift from Jenny. She is a sweet generous lady and this is the second wand she has sent me. I also finished Phyllis' page. Have you met Ms. Shabby in the City? Not only does she have a beautiful blog but she leaves the funniest comments on the blogs she visits. I love it when she stops at my blog! This book has been so fun! I keep imagining showing it to my future grandchildren some day and telling them about all the wonderful people I have met on the internet. I'm looking for more of the same size bags so I can start on Volume 2. I have lots more pages to do. The mail lady was good to me yesterday. 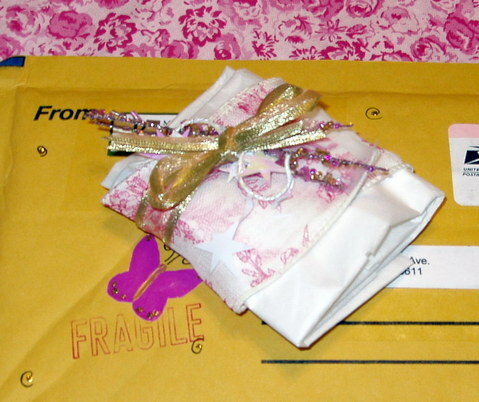 First she brought me this package from Amy at Abundant Curiosities. 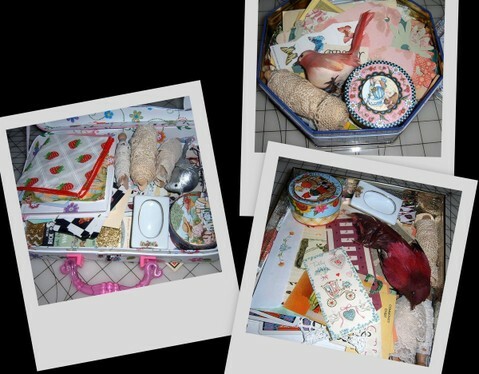 I won Amy's 100th Post Giveaway and she sent me all of these vintage goodies. 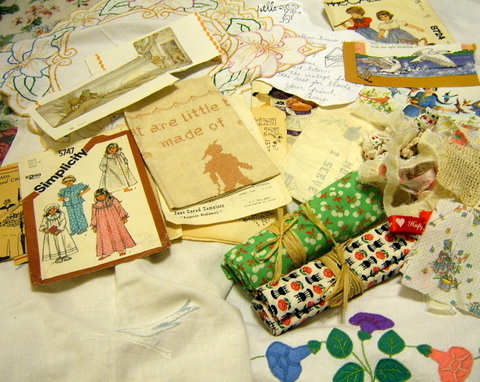 There's cute pattern packages, paper, vintage material and cloths. Wonderful! 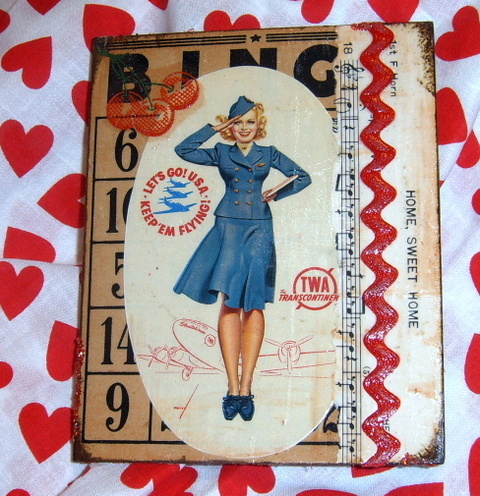 Later I went to the mail box and found this awesome bingo card made by the fabulous Miz Smoochie Lips . She did such a great job! I love it! 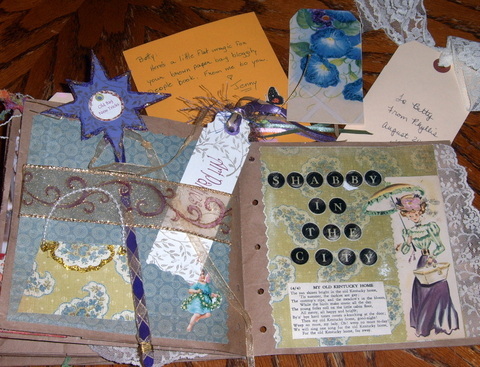 Last week, I received my brown bag album from Heidi at Everyday Cookies at Sweet Woodruff Estates. Heidi sent them to anyone that wanted one. I was waiting to decide what to do with it before I took pictures. I've decided to make it my "Bloggity Friends Book". I only have two pages done. This will be a labor of love with little bits of fluff from all of my sweet blog pals. I'd love to add you to my book so if you want to trade a tag or a bingo card with me, let me know. I'll show you the pages as I go. I think Miz Smoochie's page will be next. 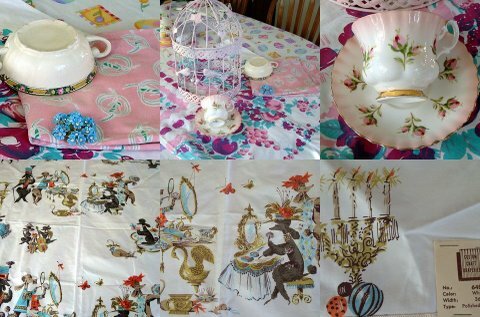 Here's a glimpse of the newest treasures in my Etsy shop. My house is overflowing and I decided to fill some cans and a cute cardboard suitcase with some of my "extras". Go take a look; maybe you will need to add to your stash. 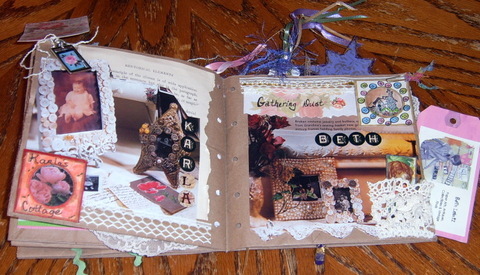 Have you been to Beth Leintz's blog, Gathering Dust? 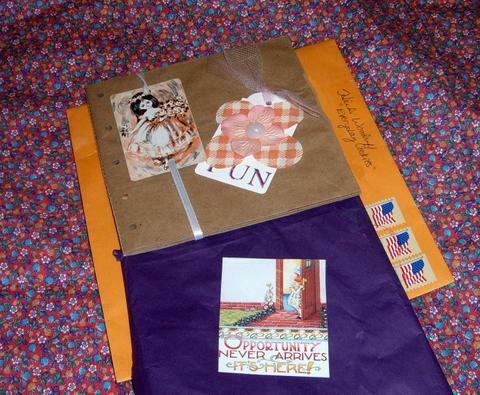 She has a wonderful story about a blue garter and a round robin letter today. I love to visit Beth. She is a gifted collage artist. 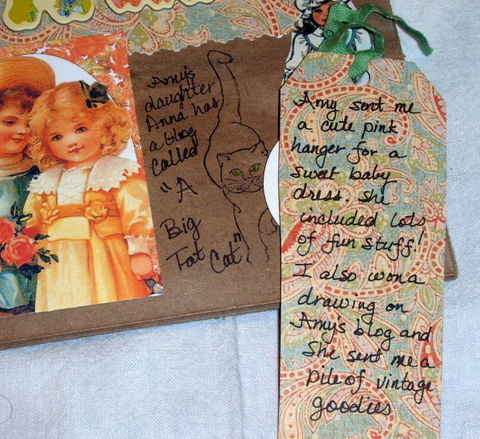 I recently bought some vintage paper and a collage pack from her Etsy shop and she added a lot of little extras. I can't wait to play with all of it. Today, I was sewing all day. This is my new favorite bag. Remember those vintage calico pup embroidered towels? 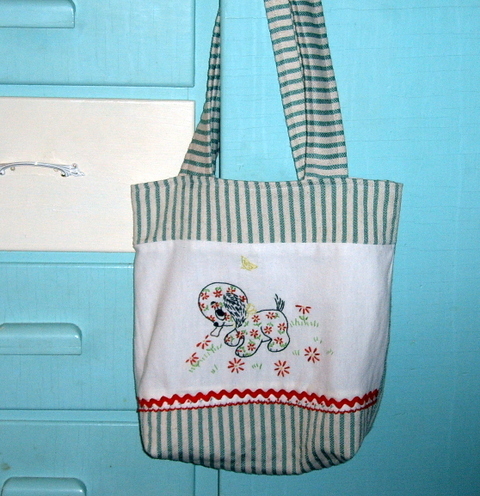 I used one of them with some green ticking and made this cute bag. I put it in my Etsy shop as soon as I finished and before I could convince myself I needed another purse. I think I have nine or ten purses that I've made that I couldn't bear to part with. Who needs that many purses?